We would all love to move into a cushy new pad, but unfortunately for most of us it’s a little bit out of our budget. But with the hand over its friendly owners, man’s best friend doesn’t have any such qualms. Constructing a DIY dog house is not just completely affordable, it’s also a fun project to take on at home. You’re not just making a luxury spot for your furry friend to hang out, but somewhere that they can seek shade during the heat, keep warm in the cold, and take a little time out for themselves when they need it. And for dogs who don’t sleep inside, they’re an absolute necessity. The size of your dog. The climate that you live in. The location of the dog house. These factors will determine the length of your measurements, where you place the dog house, and what materials you use. But once you have figured these things out, it is easy to get started. This is one of the most simple dog house designs out there, and even if you have never worked with tools before, we’re sure you’ll be able to easily complete it in one day, or over the weekend if you aren’t in a rush. This awesome diagram will help your draw out a plan of what you are going to be doing, and we can thankBurkes Backyard for this awesome design. 2 sheets of 18 mmm weather–shield ply (2400x1200mm). 1 length of 100×50 H4 treated pine, 1800mm long. Nail gun or multi attachment screw driver. Next you’ll need to draw out the plans of the dog house on your wood, keeping in mind that this design is perfect for a medium sized dog – if you wish to go smaller or bigger, your will have to adjust accordingly. Draw out the floor piece at 900x600mm (you can quickly place your dog on the base to ensure that they fit comfortably). Then draw out the plans for the sides, which should be the same size of the floor piece. The front and sides can then be drawn out at 600mm wide, and the top should be at 800mm. The gables are then cut at a 45 degree angle. Remember that the front of your house will have a doorway so your doggy can get in and out, and ensure it’s big enough. Roof panels should be slightly longer than the floor panels. Once you have your drawn your pieces, you can then cut them out. Remember to leave space between the pieces so that the saw can fit comfortably, without taking anything off the measurements. Your length of pine can be cut into three pieces st 600mm each. They will be attached below the floor piece to keep the dog house off the ground. First attach the floor planks to the floor piece using the nail gun and glue, then get to work on attaching the front and side pieces to the floor piece. It is important that each side is well anchored and won’t come apart. The sides can then be attached to the floor piece, as well as front and back pieces. Securely fasten with the nail gun and glue. The roof pieces can then be attached afterwards (if you would rather have a removable roof, simply attach the two pieces together but don’t anchor to the frame of the dog house). 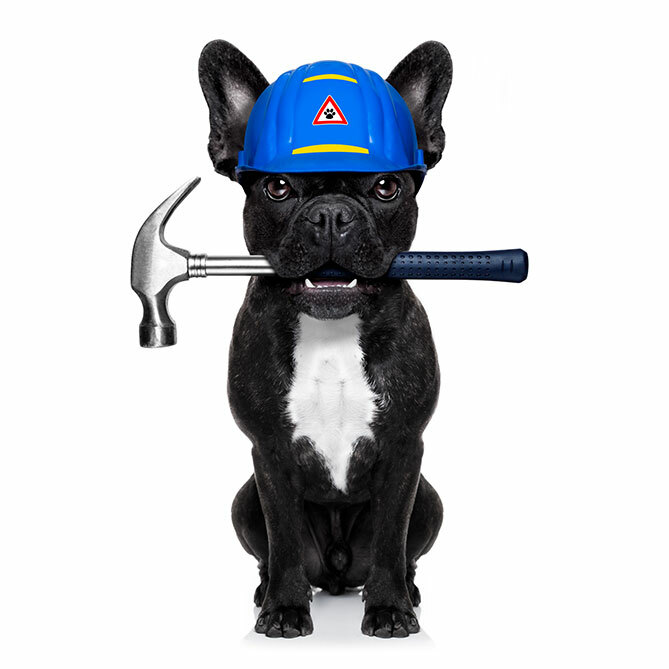 Use an electric staple to attach asphalt-impregnated roofing paper to the top of the roof, to ensure that the inside of the kennel stays absolutely warm and dry. Whether you opt for this step will depend on the climate that you live in, as it can make the dog house too warm in hot climates, and it is unnecessary if the dog house is placed in a sheltered position. Dogs are usually pretty unfussy creatures, and will happily sleep on hard surfaces such as timber floors. But does that mean they prefer too? No! Treat your dog and add a soft mattress, cushion or rug to their new home – they’ll love you for it. Once the process is over, the glue has dried, and you have checked that there are no nails sticking out or splinters in the wood, it is time to introduce your dog to their new home. Throw some treats inside and see how much they love the new, cozy home.